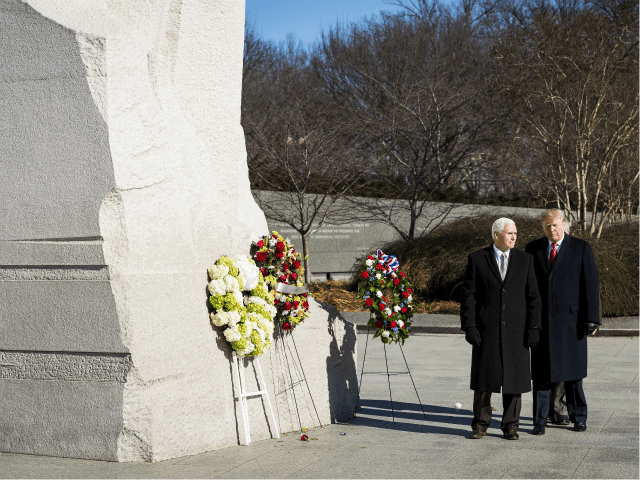 President Donald Trump and Vice President Mike Pence made a surprise trip Monday to the Martin Luther King Jr. Memorial. The president traveled via his motorcade to the monument in Washington, DC, and laid a wreath on the monument as both leaders stood together in a moment of silence. The president ignored reporters questions about the ongoing partial government shutdown. In a message to Americans proclaiming the national holiday, President Trump urged everyone to recommit themselves to King’s vision of equality. “Today, as we pause to mark the life and legacy of Dr. Martin Luther King, Jr., we recommit ourselves to the advancement of equality and justice for all Americans and to the full realization of his worthy dream,” he wrote.